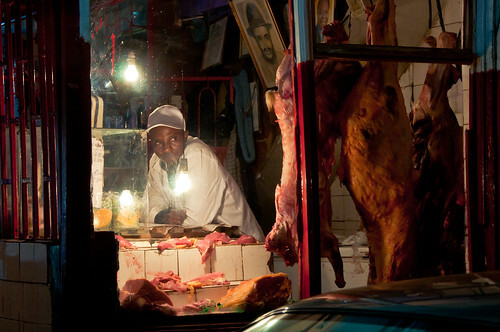 A Nairobi butcher shop after nightfall (photo credit: Flickr/Hendrik Terbeck). for much of the developing world. In case you missed it, the following excerpts are taken from an opinion piece, What’s eating sub-Saharan Africa? : New lessons in food safety and security from the food stalls of Africa’s ‘wet’ markets, published in Al Jazeera on 27 Jan 2015 and written by Delia Grace, a veterinary epidemiologist and food safety expert based in Nairobi, Kenya, at the International Livestock Research Institute (ILRI), and Kristina Roesel, coordinator of ILRI’s Safe Food, Fair Food project, based in Kampala, Uganda, and published in Al Jazeera on 27 Jan 2015. Tags: Africa, food safety, informal markets, risk assessment. Bookmark the permalink.